Ashley, would you like to send me your email address and I could send you some thoughts and links? Have a wonderful christmas yourself. Sue, but how to go about it? Where should I start? I think it must be the totally different rhythm of your life, or way of living your life that gives you what I feel must be joy. My life & work have been filled with the rush & stress of unsustainable modern living with only infrequent moments of real happiness. I imagine that living as you do is not problem free but that you are part of a living, pulsing earth. Thank you for your uplifting thoughts. Have a wonderful Christmas. Ashley, I am the most fortunate person in the world. It is a different way of life, of thinking and living and very fulfilling. Although hard at times. I don’t live there all the winter, as I do travel around and visit people, but it is home and it is my determination to live there as completely as possible. It is a tremendous thing to be in the woods when it is alive with birds and insects and sunshine as well as in the quiet, still darkness. To have a rhythm of chopping wood, living by the weather and seasons, fetching water, brushing off the solar panels, lighting fires, cooking, feeding the birds and walking the dog, as well as being part of a network of friendships in the community – feeds my heart. Please have the determination to do it yourself. Perhaps it will never happen for me but I have dreamt all my life of one day owning my own woodland if for no other reason than saving that piece of woodland for posterity. However, my days are numbered as I am already into my 60’s so it really is a dream! Help me here! What is it like to own your own woodland? How will you celebrate Christmas Day in the woods? 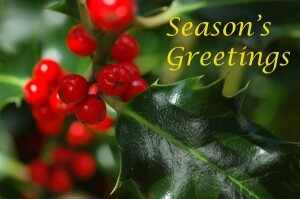 To all woodland dwellers/owners ~ Wishing you all a wonderful festive season in your woods. May you have enough solar power for your needs. This is my second winter in the wood and all is well. Many thanks for a wonderful blog. Merry Christmas to everyone who passes this way.